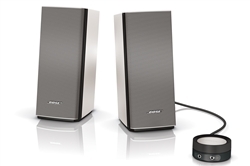 Introducing the brand-new Bose Companion 20 multimedia speaker system. Enjoy full, natural sound from your desktop or laptop computer, or tablet, from just two speakers. Bring more life to your music, games and videos, with wide, natural sound reproduced by exclusive TrueSpace® signal processing. And, the unique control pod makes it easy to adjust or mute the volume and connect headphones or other audio devices. Enjoy FREE 2 Day Shipping on the Bose Companion 20 when you buy now from ThrillingAudio! Shop with us now at ThrillingAudio.com or on eBay.